This one came HIGHLY recommended to me by our fellow readers, and I swear someone was about to bonk me over the head with their Kindle if I kept it on my TBR list any longer. I think it floated through at least three of my “official TBR lists” and believe me, I WANTED to read it. Jean: Maryse, please read Coming Home next! I beg you! It’s different from what we’ve just read and I know you will love it! Elizabeth: Coming Home took me by surprise. Just something about her writing and characters. I was “with” them every step of the way. It’s refreshing to read a story where the smallest touch can make you *feel* more than some steamy scenes in other books. I love authors that make you work for it, you know? Great pacing and main and supporting characters too. Kim: …Coming Home…simply amazing!!! One of my favorites! Jennifer: Just read Coming Home, beautiful story loved every minute of it. 5 star read. Cindy: Coming Home was such a good book! You will like this one! I got the charge… the jolt!! woo hoo! You will love him! Seriously swooning over Danny! Renate: Coming Home was a great read! Story builds at a good pace and then you get a whaaaa???? (similar to full measures in that sense). Danny was/is delish and his chemistry with Leah was awesome. Ooooh… slow burn did you say? <— Key term that gave me a jolt on it’s own! That’s exactly what I love in a love story! Why did I wait? Ahhhhh *sigh*. I have no clue. That cover (albeit gorgeous) had me wondering if it would be too smooth of a romance story, ya know? Honestly? It sounded right up my alley, but maybe I was wondering if it might be… extra sweet? I love sweet. I do! But I have to be in a mood for that kind of cozy. That kind of touching. I’m usually craving a deep story, but with plenty of emotional jolts. Adrenaline rushes. Extreme mood fluctuations and feeling-overloads. I LOVE THAT!! So when Sadie mentioned “slow burn” a few days ago, that cinched it for me! It was such a simple, innocent gesture – holding hands – but there was a significance to it that Danny could not overlook, and couple with the fact that everyone else at the table was completely oblivious to what was going on just beneath it, it seemed that much more intimate. …the tentative hugs, all with promises of keeping it “simple”. Ohhh those mixed signals are AWESOME!! Feelings take over and make a real mess of things (or an awesome start of things). Miscommunication. Big “love-rush” spikes. Hopes… dashed. Break ups and make ups. And this one had it all! Just enough of everything to infuriate me, just enough to devastate me, just enough to make me me smile, just enough to make me want to cry, just enough to make me swoon. And not too much of anything. Leah goes “home” one day (back to where she was raised), and meets the sweet elderly lady that now lives in her childhood home. Having her own version of heartbreak from her young life, and another kind of heartbreak as an adult, Leah reminisces. It’s bittersweet. And then Leah meets Danny (the lady’s very handsome grandson), when he stops by for a visit. The attraction is so obviously there, and “fate” has Danny and Leah getting together for a quick lunch soon after their initial meeting, but while Danny is obviously attracted to Leah, he keeps her at a distance. There was no way he could allow himself to see her again. Inviting her to lunch had been a momentary lapse of judgement, but to consciously pursue her? That would be reckless. His extreme hot and cold reactions to her (from sweet and flirty to standoffish and downright rude) have her perplexed. And yet… they keep managing to meet up, again and again. The mixed signals will keep you guessing, and Leah on her toes. Leah took the phone away from her ear and stared at it for a second before she thew her head back and groaned loudly. Being with him, talking to him, was the emotional equivalent of bungee jumping. There was the freedom, the adrenaline, the exhilaration of the fall, only to have it come to an abrupt halt, roughly yanking her back in the direction from which she came. Leah reached up and rubbed her eyes roughly with the heel of her hands. He could be really sweet sometimes, but he was so goddamn capricious. And he was funny, but his moods were completely unreliable. he did have a genuine kindness to him, but he could also be closed off and abrupt, and there was no guarantee as to which version of him she’d be getting. 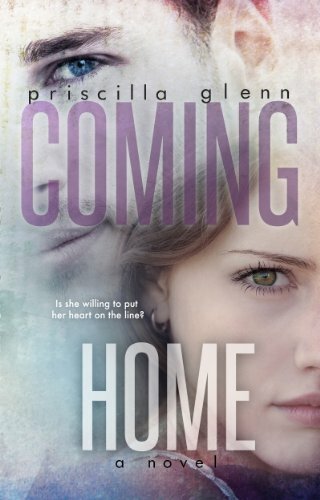 Jean: I started reading Coming Home last night after seeing all the 5 star reviews….I am loving it so far and can’t figure out the H’s big secret….of course I have some guesses….but I am only at 35% and intrigued! It wasn’t ANYTHING we thought it would be, was it, Jean? Kim: Coming Home was an ABSOLUTE beautiful read with a twist I never would’ve guessed!!!! It is a MUST read in my opinion! Yep Kim!! That twist that I didn’t even see coming. Well, I *saw* it coming, ’cause it was so obvious he had something he was hiding from her, but for the life of me, THAT was not what I was expecting! WOW!! And my mind kept thinking… nahhhh… no way. The “thing”… well. No way it’s going to go there. Right? But she took that storyline all the way through. Very impressed with the outcome. Drama right to the very end!!! Sure, I was able to put it down every once in awhile to get things done (and to sleep). I suppose it’s because this was written in “third person” point of view, and therefore, I was privy to much more information about his feelings (so, to me, it was not as tumultuous from that standpoint). Well-written “first person” stories usually have me trembling with nervous anguish ’cause I don’t know what he’s thinking (or doing), you know? 😉 But, still. This had plenty of mystery and feeling, so I was always very happy to pick it back up. And even more anxious to see where it would take me. I highly recommend it! This was an absolutely gorgeous book in every way. Fantastic writing, unique story, and so very well explored. The characters were absolutely real, to me, and I was thrilled to be a part of them. What a ride it was! I read this last week (I think!) and loved it! I loved Danny!! *le sigh* You’re review is, as always, spot on! Great review! So glad you enjoyed it! P.S. I am loving the Fae Chronicles……can’t and don’t want to put the book down! They are long like BDB series but SO WORTH IT! Thanks for that recommendation! I just finished it yesterday night and loved it!! Thanks for the review.